Medical facilities can be a unique challenge for security integrators. They tend to have a more diverse set of security needs all under the same roof. So-called “Behavioral Health” (psychiatric) units will need a tighter grip than the front door, with the entrance to the emergency department falling somewhere in between the extremes. These differences do in fact require very different approaches within the same overall design solution both in terms of doors and access control as well as security cameras and monitoring. Some areas may even be legally prohibited from operating surveillance devices. On top of this, a solid base of network security and competency from the installer is a must in an environment where a hack would lead to the compromising of medical records and billing information. Owners or shareholders of private medical ventures will share some common concerns. Diversion of drugs from the clinical setting is one of the most frequently cited reasons for smaller clinics wanting to upgrade security, but is also well within the concerns of any larger operation. These environments have lockdown capability needs similar to what is being implemented in campuses, and stand to benefit from similar mass-notification systems. Moreover, any medical facility will have to at minimum meet legal requirements concerning HIPAA laws and fire code. In large settings with many departments, it will be necessary to identify more than one decision maker. 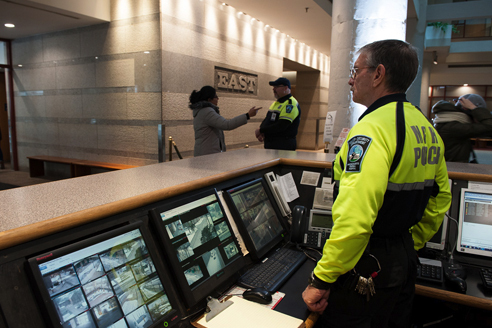 Because security and access control structure in one area tends to ripple throughout, it is typical that officers from compliance departments, HR, and security will be involved at a minimum. There are titles found only in healthcare settings such as the “CXO” (Chief Experience Officer) who deal with the patient experience rating. Because this will impact virtually every aspect of the hospital, and more directly, funding, this will be an important area of consideration in designing a system. Variations in system architecture allow for a mixing and matching of locks on interior and exterior doors to meet the needs of the customer. The demand for a “one-card solution” is already here, and increasingly users want and expect to be able to manage the functions of these systems through their mobile devices. When groups enter the building, RFID can be logged from a card carried by each person. It is possible to give varying levels of access to interior doors to different individuals, and of course to track movement and time spent in different areas. Interior access control gives advantages to both management and the general employee. Having the diverse array of technologies of todays security industry available could seem daunting, but does more to make it easy to tailor access control capabilities of each area and entrance to the complex than it does to confuse the process. The market for security in the medical field goes deep, which is why those who hold the shares and call the shots trust a dedicated outside enterprise to handle those needs.